Italian cypress trees, Cupressus sempervirens, are a low maintenance and tall growing evergreen that reaches a height up to 40 feet and spread out to 6 feet. The tree produces a narrow, column shape that requires little pruning to maintain. The Italian cypress is native to western Asia and southern Europe and hardy to plant in USDA growing zones 8 through 10. The tree is fast growing and useful in the home landscape as a privacy hedge. Select a planting location for the Italian cypress tree that has a nutrient-rich and well-draining soil. The area should receive at least six hours of full sunlight each day. Set the tree in a hole that is the same depth and twice as wide as the container it came in. Provide supplemental water to the Italian cypress tree when the weekly rainfall is less than 1 inch. Italian cypress is drought tolerant but produces better when provided with adequate moisture. Do not overwater or create standing water around the stem as this will promote root rot. Fertilize Italian cypress trees with a high phosphorous fertilizer at the time of planting to stimulate root growth. 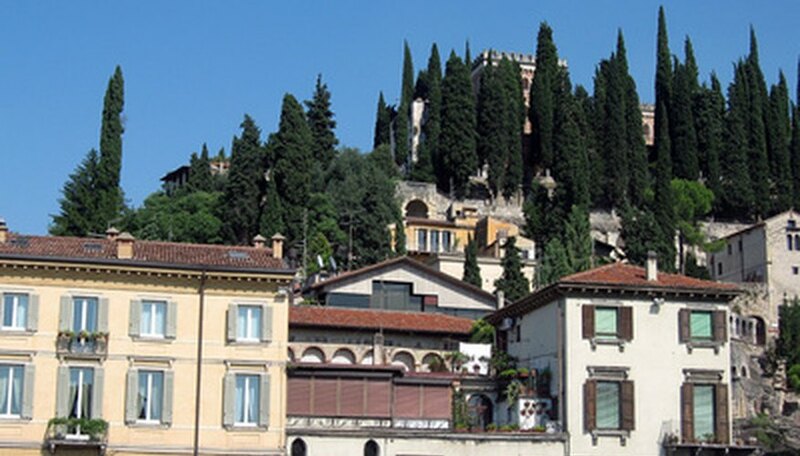 Established Italian cypress trees do not require fertilizer for growth. Apply a layer of mulch around the Italian cypress trees to limit weed growth and assist with moisture retention. Leave a 6-inch gap between the start of the mulch and stem of the tree. Prune Italian cypress trees during the dormant season to maintain a columnar appearance. The trees do not require pruning to train branch growth. Monitor Italian cypress trees for the presence of mites as they are a common problem. Mites are difficult to see but attack the interior foliage to create a red-brown colored damage on the leaves. Apply an insecticide to eliminate the insects. Propagate Italian cypress trees by taking hardwood stem cuttings in the fall. Dip the cuttings in rooting hormone and stick them in a tray filled with moist rooting medium. Grow the cuttings in a warm area with indirect sunlight until the roots are 1 inch in length.